A couple of years ago I posted this recipe and because today the weather in Houston is a bit nippy, I find myself craving a hearty, hot, spicy seafood dish: Fra Diavolo! 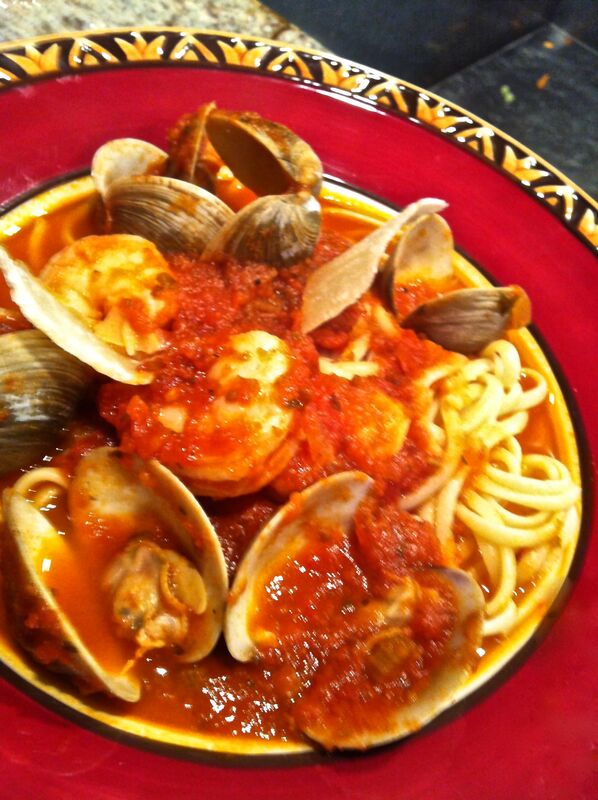 Clams and shrimp in tomato and red chile sauce. I like to serve this in a huge platter, fettucine mixed all together with the clams, shrimp and the colorful tomato sauce. It looks delicious and everyone can just dig in and enjoy. The flavor base for the fresh seafood is made with tomatoes and red chiles. “Fra Diavolo” is the name of a 19th century Italian opera. The name means “brother devil,” and refers to a real Italian bandit, a thief, Michele Pezza, “whose exploits during the Napoleonic occupation had become so well-known that folk memory ascribed supernatural powers to him”(Letellier, 2011). His character is fearsome, daring, fiery, outlaw. It is not clear when or where the Mexican chile was added to the Italian style tomato sauce, but the “Fra Diavolo” sauce is not of Italian origin. A cook, probably in NYC, (Fabricant, 1996) added the chiles, liked the fiery spiciness, and named it after that fiery Italian bandit. I don’t like that people have historically linked our chiles to bandits, outlaws, and reprehensible traits, but there it is. I can see that the dish is indeed fiery and piquant. I use Chile De Arbol because it adds a smoky taste. If you have to substitute, find a chile that adds smoky flavor, not just heat. 6 cups (1 recipe) hearty tomato sauce in my previous blog. You can also buy your favorite good tomato sauce in a jar, but no basil, no mushrooms, none of that stuff, just a straightforward Italian tomato sauce.